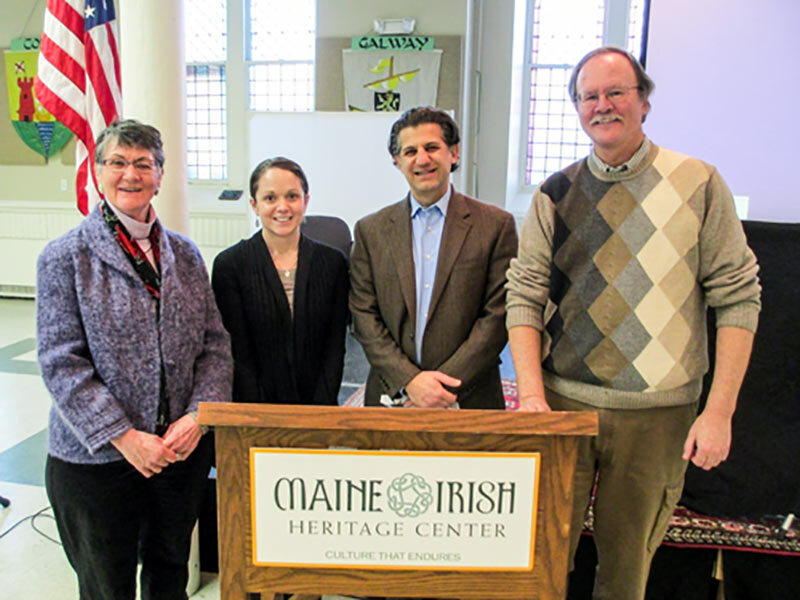 On Sunday, February 1, 2015, the Maine Irish Heritage Center (MIHC) and Saint Joseph’s College announced a partnership between the two institutions to explore areas of mutual interest and concern over the course of a two-year term. The partnership was announced at the second annual Karen Lemke Memorial Lecture at MIHC, a lecture series honoring the late Karen Lemke, a former professor of education at Saint Joseph’s College. “We are thrilled to have these two institutions working together for the benefit of the community and for those who participate in the organizations,” said Michael Pardales, Saint Joseph’s chief learning officer, at Sunday’s announcement. —an ongoing collaboration between Saint Joseph’s professor Michael Connolly, MIHC, and the College’s communications department on a documentary film chronicling, in part, Governor Brennan’s decision to choose Senator George Mitchell to fill the Senate seat left vacant by the appointment of Maine’s Senator Edmund Muskie to serve as secretary of state for the last year of Jimmy Carter’s presidency. The partnership, said MIHC’s Mary McAleney, follows years of collaboration between the two organizations and was the result of the tireless efforts of Michael Connolly. The Maine Irish Heritage Center’s mission is to protect, preserve, and restore the historic landmark that was formerly Saint Dominic’s Church, a hub of the early Irish community in Maine; provide a center for Maine’s diverse communities to share their cultural experience through education, programs, and community events; and house Maine’s Irish Genealogical Center, museum, archives, and library, preserving the story of Irish history in Maine. For more information about MIHC, visit www.maineirish.com. Saint Joseph’s College is Maine’s only Catholic college, providing a supportive, personalized, and career-focused education for more than 100 years. From its 430-acre campus on the shore of Sebago Lake, the College offers undergraduate degrees to on-campus students, and certificates, undergraduate, and advanced degrees for working adults through online programs. For more, visit www.sjcme.edu. Present at Sunday’s announcement was, from left to right: MIHC’s Mary McAleney, 2015 Karen Lemke Memorial Lecture Series presenter Amy Smith ’99, Saint Joseph’s Chief Learning Officer Michael Pardales, and Michael Connolly, professor of history at Saint Joseph’s College.